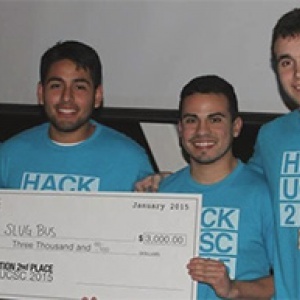 The Slug Bus team (below) was among the winners at Hack UCSC 2015. Over $80,000 in cash and prizes will be awarded to the top teams at the 2016 hackathon. Over 500 student programmers, designers, and tech enthusiasts are expected to gather on the UC Santa Cruz campus for the third annual Hack UCSC hackathon from January 29 to 31, 2016. A hackathon is a coding marathon in which teams work together to create apps and programs that provide innovative solutions to a variety of social and business issues. UC Santa Cruz and the City of Santa Cruz Economic Development Office are hosting and sponsoring the event this year, with UCSC's Division of Graduate Studies and its Center for Innovation and Entrepreneurial Development (CIED) taking the lead. "UC Santa Cruz is pleased to continue hosting, sponsoring, and strengthening the largest hackathon on the Central Coast. 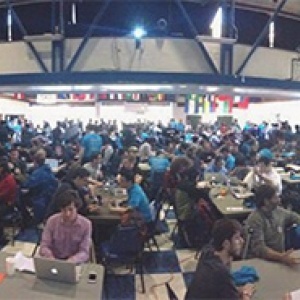 At UC Santa Cruz, we understand the importance of encouraging the development of solutions to real-world problems and the inclusion of a greater diversity of students in entrepreneurial opportunities through events like the hackathon," said Sue Carter, associate dean of graduate studies and CIED director. "UC Santa Cruz also values its vital economic relationship with the City of Santa Cruz, the flourishing local tech sector, and our partners throughout the Monterey Bay and Silicon Valley region which we serve." Student participants in Hack UCSC 2016 will form teams of up to five members. Teams have the option to include mentors (community business leaders) to help them design and build their programs over the course of the weekend. The teams will create apps in three categories: Innovation, which focuses on unique technical solutions; Tech Cares, which focuses on social good related to solving agricultural, environmental, or other community issues; and Labor Tech, sponsored by The Workers Lab to encourage students to use innovation to reduce income inequality and build sustainable solutions that help working people. More than $80,000 in cash and prizes will be awarded to the top teams. On the afternoon of January 31, the apps will be judged on relevance, creativity, and technical merit. Prizes will be awarded to the top three teams in each category. In addition to cash and merchandise prizes, winners in the Tech Cares category will be able to grant a total of $4,000 to their favorite nonprofits by way of a sponsorship from Community Foundation Santa Cruz County. "As the tech ecosystem continues to thrive in the Santa Cruz Monterey Bay Area, Hack UCSC has become an essential synapse between the city and the university, fueling the more than 550 tech companies in Santa Cruz," said Bonnie Lipscomb, director of economic development for the City of Santa Cruz. UCSC alumni Doug Erickson and Mark Adams, organizers of the Santa Cruz New Tech MeetUp, have created the hackathon to help students develop their coding skills and connect with technology leaders in the community. "Hack UCSC 2016 is bound to be another huge win for our communities," Erickson said. "At last year's event, we had a richly diverse attendance, including 22 percent females, attendees from eight different schools as far away as Mexico City, and media coverage even by the Huffington Post." Leadership sponsors of the event include Nanigans and The Workers Lab. Business sponsors include Community Foundation Santa Cruz County, Santa Cruz New Tech MeetUp, and South Swell Ventures. Participants are encouraged to discuss project ideas on the Hack UCSC 2016 Facebook page or can get more information at hackucsc.com.